ASP.NET model binding is quite powerful and flexible. It caters to most of the scenarios without much configuration from developers. However, at times you may need to intervene in order to achieve the desired model binding effect. One such situation is when you use multiple instance of a partial view on a view. This article shows one possible approach to deal with such situations. 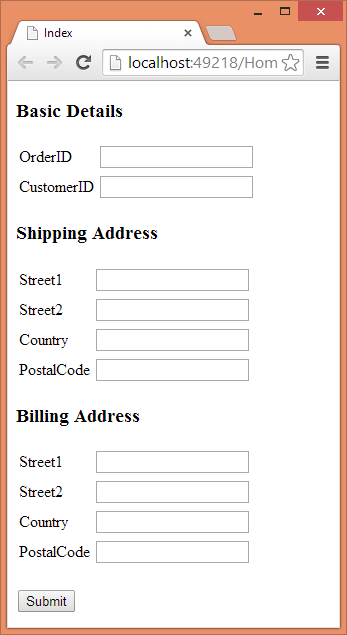 The Order class consists of four public properties namely OrderID, CustomerID, ShippingAddress and BillingAddress. Notice that OrderID and CustomerID are integer properties whereas ShippingAddress and BillingAddress properties are of type Address. 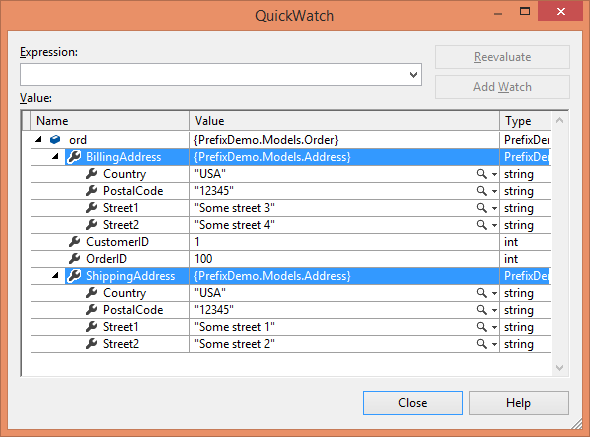 The Address class is also shown and consists of four string properties - Street1, Street2, Country and PostalCode. Note that _BasicDetails partial page has its model set to Order class. 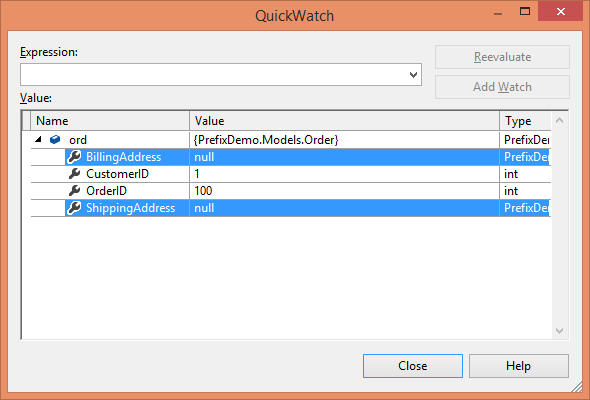 The partial page then uses LabelFor() and TextBoxFor() helpers to display a label and textbox for the OrderID and CustomerID model properties respectively. The _Address partial page has Address class as its model and uses LabelFor() and TextBoxFor() helpers to display model properties. The Index view renders the _BasicDetails partial page using Partial() helper. Since the model for Index view is Order class, the same is available to the _BasicDetails partial page. Then two instances of _Address partial page are rendered on the page to capture ShippingAddress and BillingAddress respectively. Recollect that _Address has Address class as its model. So, Model.ShippingAddress and Model.BillingAddress are passed to the Partial() helper. Both of these methods are quite straightforward and need no explanation. As shown above the ShippingAddress and BillingAddress properties are null whereas OrderID and CustomerID are captured successfully. The variation of Partial() helper used above uses ViewDataDictionary parameter to specify TemplateInfo. The HtmlFieldPrefix property of the TemplateInfo is set to ShippingAddress for the first instance and to the BillingAddress for the second instance. The model binding now correctly captures ShippingAddress as well as BillingAddress information.